The most user friendly ACCA approved software for calculating residential loads using Manual J8 (Rev-2.5 which is the up to date Latest) methods. Includes ACCA Manual S Equipment Selections! Fast, accurate, point & click features allow block, room x room and zoning calculations in just minutes! • ACCA Manual J8 Approved Heat Gain/Loss Calculations! • Add zones/multiple systems w/ drag and drop! • AccuCheck feature checks for input errors! • Rotate house and globally change inputs! • Includes Manual S Equipment Selection! Following the same format as AccuLoad, users now have the ability to access the program via the web on any device for a mobile solution! ACCA Approved and designed on Manual J 8th Edition. • Call for a free demo today! This program will dramatically show the operational cost savings of HVAC equipment: geothermal, gas, oil, electric, and hybrid heat pumps. The use of many attractive charts, graphs, and reports will help close the sale every time!! The Ultimate In-Home Presentation Software. Easy-to-use, step-by-step method to provide your customers with a customized proposal while delivering a professional presentation of your dealership. • We import your dealer pricing for you at No Cost to you!! • We format Proposals/Quotes to match the format you want!! • We import your Logo and terms/conditions at No Cost to you!! Set your security for the Electronic Consultant program by giving each member of your sales staff a username and password, along with a security level. This allows your Electronic Consultant program to be fully secure. An easy to use scheduling tool to assist in maximizing incoming customer calls. A quick, whole house block load program designed to provide a load in minutes! Based on Manual J7. Easy Loads is a quick and easy load calculation program designed on creating simple whole house load estimates for replacement applications! 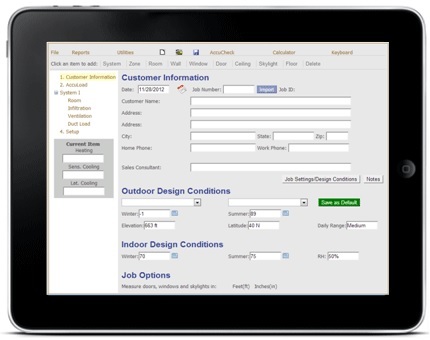 Add walls/windows with the click of a button and calculate load estimates very quickly! 7 Fast and Easy Steps and you're done! 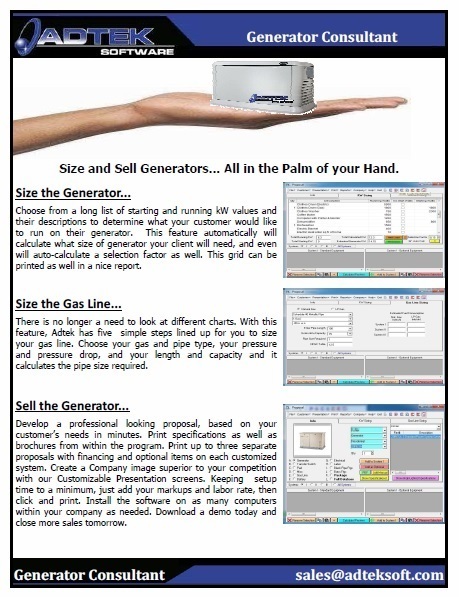 This program will allow the user to size the generator and gas line, and sell the generator in one fluid motion. Choose from a list of kW values, size the gas line, and develop a professional proposal in just minutes.